I have noticed a large swell in the articles I read from people who are both single and in marriages/relationships who don't believe in monogamy. Usually the premise is that humans are just not meant to only sleep with one person. To me, this sounds crazy lol, but I have to take into consideration that everyone's lives are different and everyone has the right to define their relationship as they see fit. I personally believe that you can be completely happy married to and only sleeping with one person. But that's because that is my reality. Everyone's life isn't my life. I have no problem with the "non-monogamists" of the world. I do however have a problem with "anti-monogamists," if that makes sense. Those are the people who tear monogamists because they dare to believe they can be happy with just one person. To them I say: don't place your circumstances on others. Just because you have never found a person worth marrying, or worth being monogamous for doesn't mean monogamy/marriage is flawed, it means your relationships have failed at monogamy. I agree. People who project their issues onto others, cannot stand it. I have friends who aren't monogamous but they respect my monogamist relationship so we're good. There's no need to be rude about views which is what you're talking about. i try to take every situation at face value. But in my experience I'd prefer a monogamous relationship. My upbringing and my faith have a lot to do with my decision. It's what I want for myself...i can understand the counter arguments, but to me its sort of a "pick your poison" matter -- to each their own, but neither is going to be an easy road. @A.Sharie & Curly Film Chick- I'm definitely with you both. Definitely makes sense! I hope I've never come off as an anti-monogamist, although I do know I get pretty aggressive sometimes :) It's funny because for the most part I do still consider myself a "monogamist" because I spend most of my time with J alone, we do all the couple-y things like cook dinner, see movies, decompress... we never want to have more than one "relationship" ... just the occasional fun. I think that's what separates me from a lot of the other non-monogamists. I think being in a relationship with more than one person would exhaust me. Agree. People who are into non-monogamus relationships are really starting to develop an attitude, just like a lot of homosexuals. It truly is the day where folks call good evil and evil good. 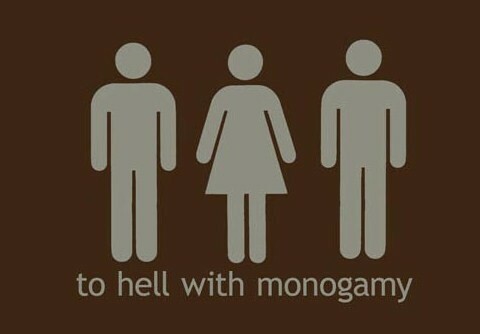 @suggestivetongue - Noo, you've never come off as an anti-monogamist lol. i agree...i think marriage is an individual choice between the individual and their faith and no one should place value on what another decides to do in their marriage.. I see your point. However, I'm curious to know what articles you have been reading because I might be reading into your opinion the wrong way. Are we talking about Polygamy or swingers? LOL ... I disagree with Polygamy because it often involves slavery on some part of the femaale -weather it's mental, physical or emotional. Swingers on the other hand, are couples that are making choices on a (generally) leveled playing field. @onewu2 - People in a relationship or single who while they have a boy friend/girlfriend/husband or wife they don't believe the relationship could work without them being allowed to sleep with other people. Those same, who will say that a monogamous relationship cannot be a happy relationship because the couple is denying their desire to sleep with other people. I'll start to gchat you links when I come across them! Woaw! That's quite interesting! I thought that was just an excuse to be a player but if it's a growing sentiment within both males AND females, then I can totally see why it should be respected. Thakns for sharing.